Welcome to my website celebrating the past and present of my 1938 Morris 8 Series II Four Door Sliding Head Saloon DOX 835, or 'DOX' as she is called. My name is Bob Bryan and I live near Great Malvern in England. 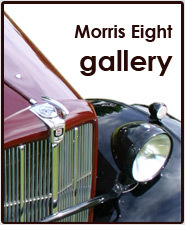 The website is primarily about this particular car, but I 'live and breathe' 1934 -38 Morris 8s and have researched these cars in great detail, gathering together substantial amounts of history and information. All of which may be of interest and use to fellow enthusiasts. I consider that I was one of the lucky ones, as I was fortunate to purchase from the original owner a complete car in an unspoilt state many years ago, and therefore I know exactly how it was put together. Please take a look at the Gallery and browse through the History and Articles. Then if you want to, please contact me with any questions or comments that you may have. I would be only too pleased to hear from you. I do hope you find enjoyment and interest as a result of logging on. 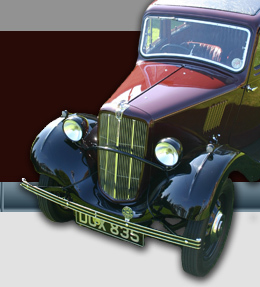 The Series II Morris 8 was introduced in 1937 remaining in production for about a year, being followed by the more modern Series E. DOX 835 was first registered in Bournville Birmingham on 25th March 1938. I purchased it from the original owner in October 1966 for £25. After a painstaking but sympathetic restoration it went back on the road in 1999, since when I have clocked up about 11000 miles. Its major components are restored original items, the seats and doorcasings are original and it has been repainted, the colour being matched to a hidden section of the original cellulose. Sharp eyed folk will note the curved bar on the front........not an original factory fitting.........but it has been on the car since her very early days. For further information including details of the restoration, see the History page. For photographs past and present see the Gallery.